Earlier today, we reported that Nintendo chief Satoru Iwata told a Japanese newspaper that a motion sensor in the successor to the DS would be "necessary." That reminded me of something Nintendo's Shigeru Miyamoto told me in 2004. 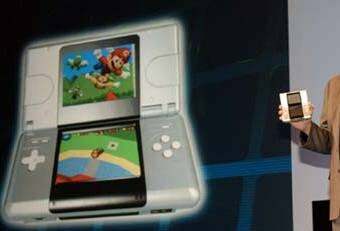 Just days before the official start of the E3 gaming trade show that year, Nintendo's chief game designer provided me a private demonstration of the then unreleased Nintendo DS. He introduced me to the system's dual screens, touch screen and microphone. And he told me the feature that Nintendo omitted. Nintendo had experimented with tilt controls previously, including a motion sensor in the cartridge for the Game Boy's 2000 game Kirby Tilt 'N Tumble. In 2004 Nintendo would release Wario Ware Twisted, a Game Boy Advance game with a cartridge containing a rotation sensor. Iwata told the Asahi Shinbun this week that a DS successor would need motion detection: "[It will have] highly detailed graphics, and it will be necessary to have a sensor with the ability to read the movements of people playing." Current Sony and Nintendo handhelds do not detect motion. The Apple iPhone does. Just as some other long-discussed Nintendo projects such as Miis have come to fruition in recent years, now it seems that a motion-controlled Nintendo handheld may be upon us. Kotaku has requested clarification on plans for a new motion-sensitive handheld and will update you if we find out more.